But no thanks to TSA. Security measures at the Victoria Clipper terminal were fairly insane. In stark contrast to the security measures at the Amtrak station, which were totally non-existent. See the whole story of my homeward journey towards the bottom. 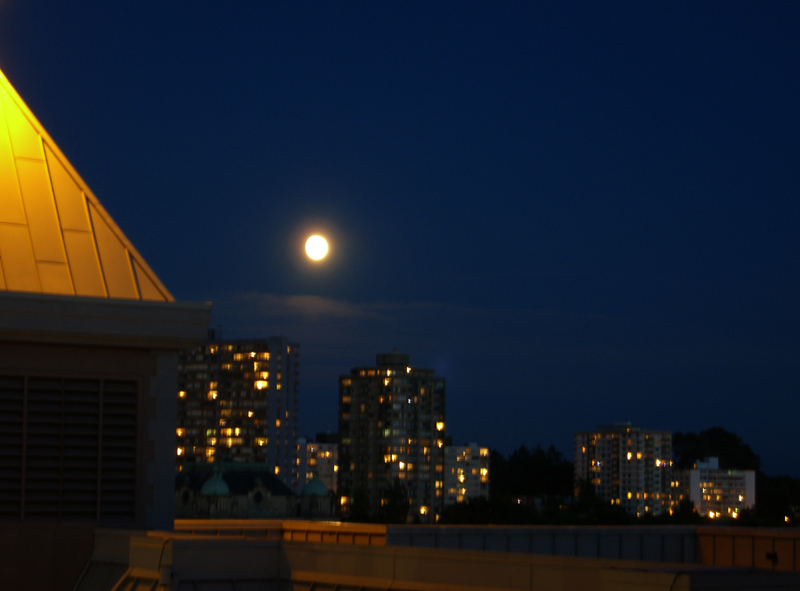 The first picture is of the moon rising over Victoria Monday night. I sat and watched it for a long time. It was soooo big and sooo bright. Just amazing. Be sure to click on the picture to see the biggy size version. I walked around a lot on Tuesday. I was tired when I left for vacation. But when I woke up Tuesday morning, already I felt energized. A little overcast weather wasn’t going to stop me! I was rarin’ to go. I signed up for a Victoria Harbor Water Taxi tour up the gorge to the reversing waterfall. The gorge is a fjord off the harbor, and the fall reverses when the tide changes. The water taxis are the cutest little boats! I understand that they do a little dance thing around the Harbor on Sundays — I heard it compared to the hippo ballet in Fantasia, only on water. I was sorry not to be there on Sunday to see it. 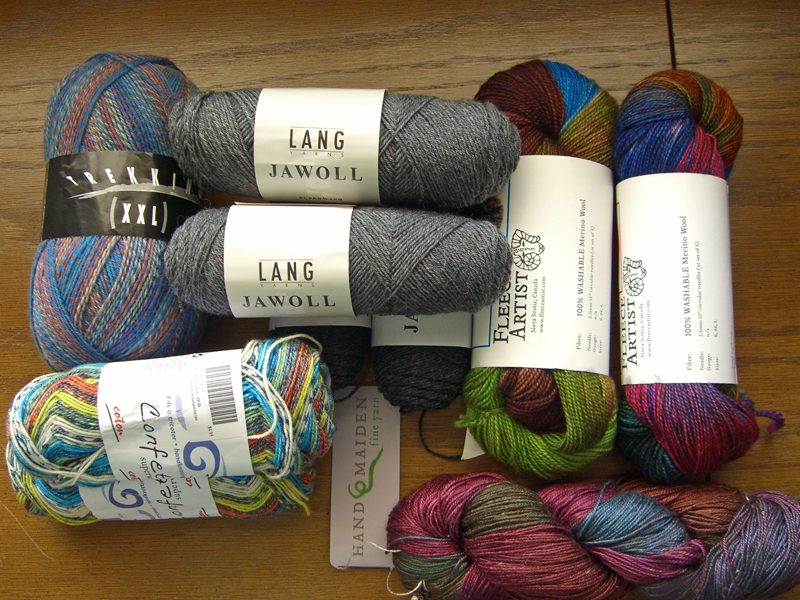 Did I mention that there was yarn in Victoria? Well… OK… maybe just a little bit of it. And maybe I found some at Beehive Wool Shop. This is a simply amazing little local yarn shop that has been serving Victoria for (get this) 100 years. Isn’t that amazing? 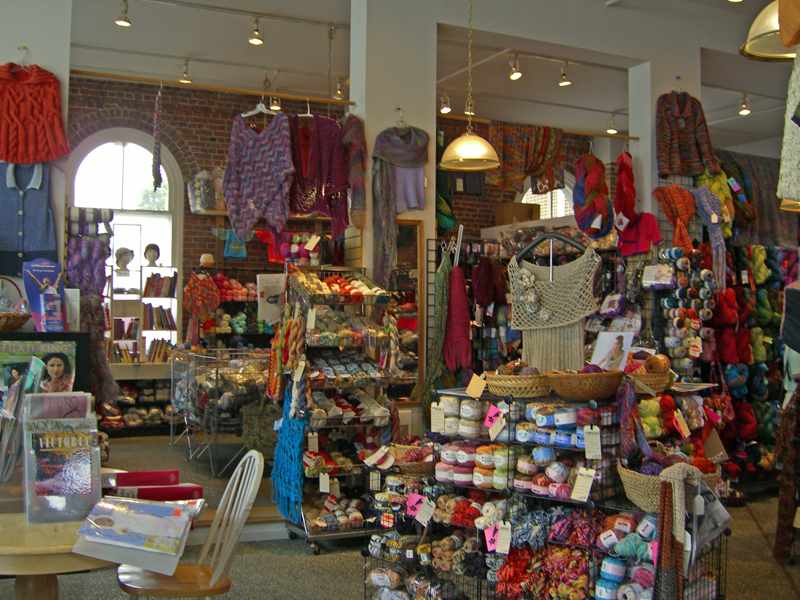 And they had lots of yarn! The store is simply packed, all the way up to the rafters. This picture shows only about 1/2 of the store. Somehow, some yarn managed to find its way into the shopping basket that the helpful clerk handed me as I wandered around. Go figure. It’s mostly sock yarn. But the Sea Silk at the very bottom of the bottom picture I’m saving for a special something. Sea Silk is made from silk (duh) and… get this… seaweed. It has amazing drape and sheen. I can’t wait to knit with this stuff. I wish I could have afforded more of it. Lest you think that no knitting was accomplished, however, let me tell you that I carried around a couple of balls of yarn and some needles in my purse and I knit whenever I was waiting — in line, to be served, in the train, in the Clipper. It’s STR in a colorway called “County Clare” that’s a mix of blue, greens and gray. I’m knitting socks (natch) in a diagonal yo pattern. I’m almost up to the gusset increases. Which isn’t bad, I think. This picture is of the Inner Harbor on Wednesday morning. Wednesday was the best day, weather wise. Tuesday was overcast, and there was a little tiny bit of drizzle late in the day. On Thursday when I left it was raining. But Wednesday was glorious. Wednesday was supposed to be my spa day, because it was forecast to be the rain day. But how can you stay inside when the weather is like this? 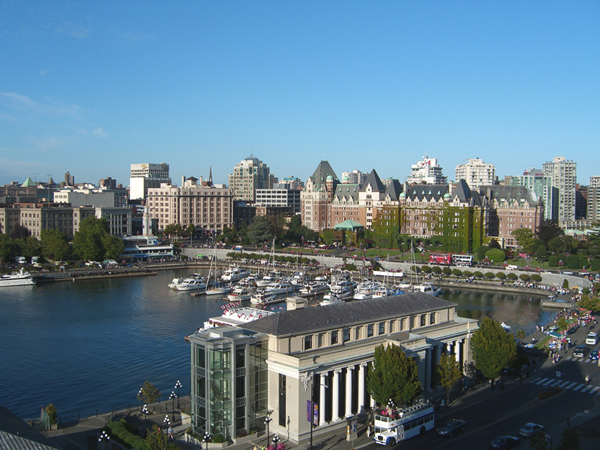 Fortunately my spa appointment wasn’t until 3:45, so I had lots of time to walk around and enjoy Victoria. I decided to take a little horse-and-buggy tour of the city, which I’d never be able to get away with if #1 Son were with me! We went through the park and some of the old neighborhoods of Victoria and a sedate walk. Lots of people took pictures of us. I waved. It’s funny to think that I will end up in lots of people’s vacation scrapbooks. After the spa appointment, I went back to my room. 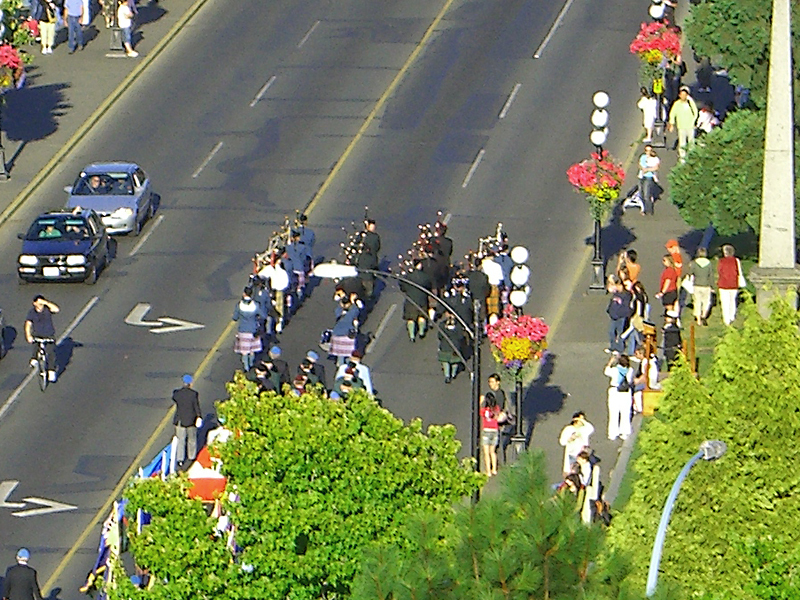 I heard a marching band outside, and went out on my balcony to find this. That’s right, gentle reader, even from 10 stories up and a block away, I could spot men in kilts! Oh, yeah! It was raining when I woke up Thursday morning. I fancied that the city was sorry to see me go. But it was time to head for home. There were a few people waiting to go through Immigration who “forgot” to check their cell phones. Darn it, they said smugly. Oh well. They weren’t quite so smug when their cell phones, etc., were confiscated at the xray machine and tossed in a bag to be sent with the rest of the baggage. I was happy I’d played fair because the nice check-in person had put a fragile sticker on my small bag after I put all of my electronics in there. The bag contained nothing but yarn, anyway, so I was fairly certain that my stuff would make it through OK. I felt very naked without camera, cell phone and Palm (aka “my brain”). One of my fellow passengers questioned my knitting needles being allowed. I promised not to stab her with them, for which I was awarded a very startled look. Since everybody had to check absolutely everything, the Clipper was about 2 hours late. I was OK. It just cut my wait time in the Seattle train station down to a reasonable 30 minutes or so and there was no mad dash to the train station as there had been on my outbound trip. I do feel for those who were leaving the Clipper terminal only to face the madness of the airport. That can’t have been fun! At the train station, a big sign read Due to construction we are unable to check any luggage. Yeppers, ya had to carry it all on with you. Nobody looked at my ID ever. Nobody looked at my ticket until after the train had left the station with me aboard it. It was a refreshing change. But I did sort of wonder why we expect terrorists to take ferries, and therefore suspect all passengers of having nefarious intentions. But not trains or train riders. #1 Son was supposed to pick me up from the train station, but he had called to let me know that his band was playing a show and he wouldn’t be able to come. But he did park my car at the train station, so I could drive home instead of taking Max or a cab. And he thought up that solution all by himself! I though it was pretty clever. Until I started wandering around parking lots trying to find my car. It’s a fairly distinctive car and should be easy to spot. Should be. I finally called him and asked where, exactly, had he parked it? Oh, he said it wasn’t exactly at the train station. It was probably closer to the Greyhound depot. I should try over there. I was glad to be home in my own bed with my cats around me. You can see more pictures from Victoria by clicking here or from the Galleries page.